This forms Section H.6 of An Anarchist FAQ which is the section of the FAQ that deals specifically with the Makhnovist movement. The Section forms part of the pages of this website, including all internal links, however links to other sections of An Anarchist FAQ and links to some other cited works are external. H.6 Why does the Makhnovist movement show there is an alternative to Bolshevism? H.6.1 Who was Nestor Makhno? H.6.2 Why was the movement named after Makhno? 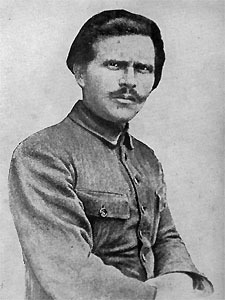 H.6.3 Why was Makhno called "Batko"? H.6.4 Can you give a short overview of the Makhnovist movement? H.6.5 How were the Makhnovists organised? H.6.6 Did the Makhnovists have a constructive social programme? H.6.7 Did they apply their ideas in practice? H.6.8 Weren't the Makhnovists just Kulaks? H.6.9 Were the Makhnovists anti-Semitic and pogromists? H.6.10 Did the Makhnovists hate the city and city workers? H.6.11 Were the Makhnovists nationalists? H.6.12 Did the Makhnovists support the Whites? H.6.13 What was the relationship of the Bolsheviks to the movement? H.6.14 How did the Makhnovists and Bolsheviks differ? H.6.15 How do the modern followers of Bolshevism slander the Makhnovists? H.6.16 What lessons can be learned from the Makhnovists?